For the longest time potatoes have been listed in the high carb fattening food category and all we keep hearing is to avoid potatoes if you want to be healthy. Well, there exists another unexplored side of the story! Potatoes are loaded with essential micronutrients like Vitamin A, C, B, and iron and phosphorous. These starchy tubers have amazing health benefits! For those who believe in the power of nature read on! From our Desi Aloo Parathas (Wheat Flat Breads) to the world famous fries, Potatoes are loved widely by all cultures across the globe. Apart from being a star in the kitchen space, there are several other uses one is unaware of. Did you know that Potato juice can be used for hair, skin care, tackling joint pains & immunity related issues? Potato Juice for Skin Care: Skin related issues such as skin darkening, scars, spots, blemishes, hard skin and tan reduction can be tackled with Potato juice. It removes excess oil, acne, clears pores and makes the skin look radiant. With skin bleaching properties that help to clear blemishes and correct uneven skin tone, Potato juice reduces appearances of fine lines, tightened skin and reduces wrinkles. So much from a simple juice! How to USE: Potato juice can easily be combined with a range of skin-benefiting ingredients like Cucumber juice, Fuller’s Earth (Multani Mitti), Gram Flour (Besan), Aloe Vera and even Olive oil. A scrub can be made by combining Gram flour (Besan)/ Wheat Bran/ Ground Oats with equal quantities of Lemon juice and Potato juice. Mix well and gently rub it on the affected area. 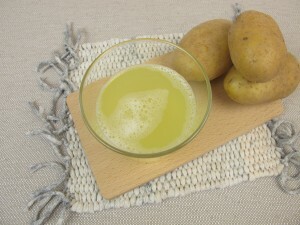 Potato juice can also be mixed with curd/ honey/ lemon juice/orange juice to be used as a face pack. It will help tighten the skin and give a clearer, brighter glow. Potato Juice for Haircare: Potato juice overall improves hair health and treats conditions like dandruff, dryness, redness, flaking and itching of the scalp. It can help improve hair texture by making it softer, delaying early grey hair and helps hair fall conditions too It helps in persisting eczema or reduces oozing of the sebum from scalp pores. How to USE: Take the juice of 2 raw potatoes and add 1 tablespoon of honey, 1 egg yolk. If you want to avoid egg you can add 2 tsp of Aloe Vera gel. If you find honey sticky- you can use 1 tsp of virgin coconut or olive oil instead. Apply this mixture to the roots and shampoo as usual, after one hour. You will notice good results after applying this every once or twice in a week. Eye care: Potato juice comes to the rescue of people facing under eye issues. It helps reduce under eye circles speedily and effectively. It helps the eyes to relax and reduces strain after a long day at work. Since the skin under the eyes is very thin, it tends to wrinkle very fast. Regular application of potato juice on the affected area can lead to positive results. How to USE: Soak eye size cotton pads in cold potato juice and apply on eyes for 20 minutes. Remove and gently wash eyes. You can use a moisturizer if your skin feels dry. Immune system: Potatoes contain a significant amount of vitamin C -the nutrient that fights colds and infection and helps to strengthen the immune system. Drinking a glass of potato juice regularly wards off diseases and helps improve one’s immunity. It also increases circulation in the human system, thereby improving overall health. Joint related issues: Potato juice has wonderful anti-inflammatory properties that help to relieve all most all kinds of pain related to swelling, inflammation, or redness. It helps in neutralising and flushing out Uric acid which is the major cause of joint relates issues. Applying compressed potatoes to the joints directly or wrapping a sliced potato to the joint with the help of fabric bandages is helpful in eliminating the soreness and pain. This makes potato juice one of the best natural treatments for gout and pain associated with arthritis. How to USE: To extract maximum benefit drink raw potato juice, 1 glass in the morning and 1 glass in the night. GI tract benefits: Potato juice works as an excellent antibacterial probiotic drink. It helps reduce acidity, heartburn, constipation, bloating and flatulence. Potatoes contain a significant amount of fibre, with unique antibacterial molecules which help in treating constipation and cleansing our digestive system. Drinking 1 glass of potato juice every day can help in preventing and treating many gastric and digestion related issues. Heart-healthy ingredient: Potatoes contain essential nutrients like fibre and vitamins A, B-complex and Vitamin C fibre. These nutrients help lower the cholesterol levels in the body. Potato juice can help prevent strokes by reducing deposition of fats in arteries as it contains antioxidant and anti-inflammatory compounds. Peel the potatoes and grate them. Or you can also chop the potato and grind them in a mixer. Put the grated potatoes on a linen cloth/ sieve and squeeze out the juice. Since potatoes are 80% water one can get around 1/2 cup juice from 2 medium sized potatoes. Which is safe to be consumed. Drink the juice immediately or you could let it cool in the refrigerator for a while and then drink it. If you have any health-related issue and are advised to stay low on potassium then check with your doctor before consuming potato juice as it has high potassium levels. Pregnant and breastfeeding women and diabetic patients should consult their physician before drinking potato juice as it is high in sugar content. Also, this juice can cause an upset stomach, or cause diarrhoea and vomiting if consumed in excess.